Want to get a VIP backstage access at UFC 127: Penn vs Fitch event in Sydney, Australia? 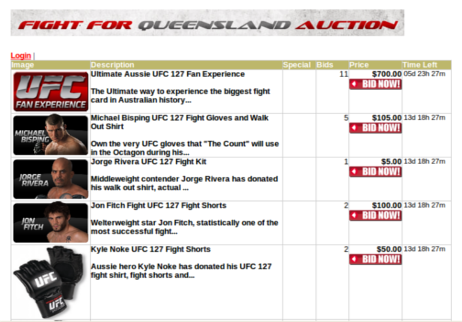 Join UFC and help the people of Queensland by making a UFC 127 bid. As the Ultimate Fighting Championship comes back to Sydney, Australia for UFC 127: Penn vs Fitch, the promotion aims to raise money for the Queensland Premier’s Disaster Relief Appeal. Set up by the Queensland government, the Appeal will help the Queenslanders affected by the recent flood and Tropical Cyclone Yasi. The UFC and its fighters will donate unique UFC 127 memorabilia and a VIP backstage access for its Sydney event. People interested to help can visit UFC’s The Giving Bridge website for more information and live auction. All the proceeds will go to the Queensland government’s disaster relief.